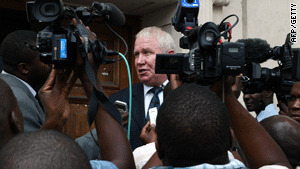 Roy Bennett speaks to the press outside the High Court in Harare, Zimbabwe, in March. Harare, Zimbabwe (CNN) -- Controversial Zimbabwe politician Roy Bennett, a longtime opponent of President Robert Mugabe, was acquitted Monday of all charges, including terrorism, his lawyer said. Judge Chinembiri Bhunu ruled that the state failed to prove its case. The judge found Bennett not guilty of all charges: banditry, sabotage, terrorism and insurgency. "He is now a free man," lawyer Trust Maanda said. Bennett could have faced the death penalty. "I hope that sanity is now creeping into the system and we can now start concentrating on delivering better lives for the people of Zimbabwe," Bennett told CNN from Harare. The treasurer general of Prime Minister Morgan Tsvangirai's Movement for Democratic Change had been on trial since November, accused of plotting to overthrow the government. Bennett, a white farmer whose land was seized during Zimbabwe's controversial land reform program in 2000, has long been a thorn in the side of Mugabe's Zanu-PF party. He has been thrown in and out of jail several times. The MDC intended to make him deputy agriculture minister in the national-unity government between the former opposition and the president's party, but Mugabe refused to swear him in. He said Bennett first needed to be cleared of all charges. The MDC has always maintained that the case against him was political and that Bennett was being persecuted and not prosecuted. It remains to be seen whether Mugabe will swear in Bennett now that charges against him have been dismissed. "Mugabe has to swear me in now," Bennett said Monday. "My party has made it very clear that they expect nothing less."